Navid, Abe Asadi (from the International Federation of Iranian Refugees – IFIR), and I were talking this evening. Navid’s asylum application has been rejected for the second time. My first reaction was: “There must be something wrong here!” Then I thought to myself, “But of course there is!” Swedish immigration authority is not different than their Turkish or Pakistani counterparts in so many ways. Let me give you a picture of how this asylum process works. Usually a bored paper-pusher who doesn’t know jack about Iran and the political situation there, whose height of knowledge on the subject is his/her interpretation of the lame, periodic report from the foreign department, goes through a checklist while musing about his/her dream job, or 22 SEK worth of “LOTTO” and the “dream prize” of this week, occupying his/her position not because of passion for humanity, but only because there were not other more interesting and better-paid jobs available, and so they had to pick between serving at Burger King or this one, and chooses the one with more security…is now deciding the future for Navid and others like him. To impress that mountain of political knowledge, analysis, and human compassion and solidarity, you need to be a stand-up comedian, not a political activist. Nothing is right about this! I know Navid through his political activities here in Sweden. 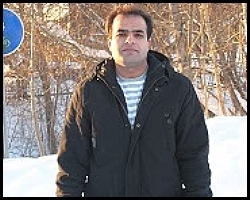 He was the organizer of the Örebro events and protests against the stoning of Sakineh Mohammadi Ashtiani and against Mahmoud Ahmadinejad’s presence at the UN General Assembly meetings. We told Navid this evening that he shouldn’t worry much. He is not alone in this, and we with all our organizational authority and power are behind him. From this moment, IFIR, Mission Free Iran and No Human is Illegal are engaged in a joint effort, acting on behalf of Navid Mirpourzadeh. This page belongs to Navid, and from here we will coordinate our efforts to set our record straight with those paper-pushers of the Swedish immigration authority. نوید میر پور زاده دانشجوی سابق معماری دانشگاه آزاد واحد گچساران که به اتهام نشر و تکثیر کتابهای اینترنتی و مقالات ضدّ حکومت در ایران توسط اداره اطلاعات گچساران طی دو نوبت دستگیر و به مدت ۲۰ روز مورد شکنجه و آزار اذیت روحی‌ و روانی‌ و در نهایت اخراج از دانشگاه شد مدت ۱/۵ سال است که در اروپای مهد حقوق بشر سرگردان و آواره است و از سوی هیچ نهاد حقوق بشری نیز حمایت نمی‌شود ، نوید برادر حمید میر پور زاده است که عضو سندیکای کارگری نیشکر هفت تپه بوده و در سال ۱۳۸۰ توسط وزارت اطلاعات اعدام شده . او پس از آزار و اذیت‌های مداوم وزارت اطلاعات و اداره کلّ اطلاعات استان خوزستان و همچنین اداره اطلاعات شیراز به ناچار در سال ۱۳۸۷ خاک ایران ترک کرده و هم اکنون ۱/۵ سال است که به صورت بلاتکلیف در اروپا ساکن بوده از سوی هیچ نهاد حقوق بشری حمایت نمی‌شود . نوید همانند سایر دانشجویان سیاسی به خاطر نوع فکر و عقیده‌اش و به خاطر اعدام شدن برادرش در ایران تحت انواع آذر و اذیت‌های روحی‌ و روانی‌ وزارت اطلاعات قرار گرفته و حتی از تحصیل هم باز ماند و حتی خواهرش نیز پس از قبولی‌ در دانشگاه دولتی در گزینش تائید نشده و از تحصیل محروم گردید ، نوید هم اکنون در سخت‌ترین شرایط در حال سپری کردن دوران پناه جویی خود در اروپا است بدون دریافت هیچ نوع کمک و حمایتی ، و این وظیفه بر دوش من و شما و کسانی‌ است که خود مدیون افرادی چون نوید و برادرش میدانند که خون خود را در راه آزادی ایران اهدا کرده و هم اکنون نیازمند کمک و همیاری من و شما هستند . به عمید آزادی ایران و رهایی تمام نویدهای سرزمین ایران زمین از دست جلّادان حکومت صّفاک آخوندی . « Behnam Ebrahimzadeh has gone on hunger strike. Help us save him!